= Medionidus conradicus (Lea, 1834). — Williams et al. (2017). = Medionidus conradicus. — Chong et al. (2016). = Medionidus conradicus. — Jones (2015). = Medionidus conradicus (Lea, 1834). — Roe (2013). = Medionidus conradicus. — Haag (2012). = Medionidus conradicus (I. Lea, 1834). — ITIS (2012). = Medionidus conradicus. — Grobler et al. (2011). 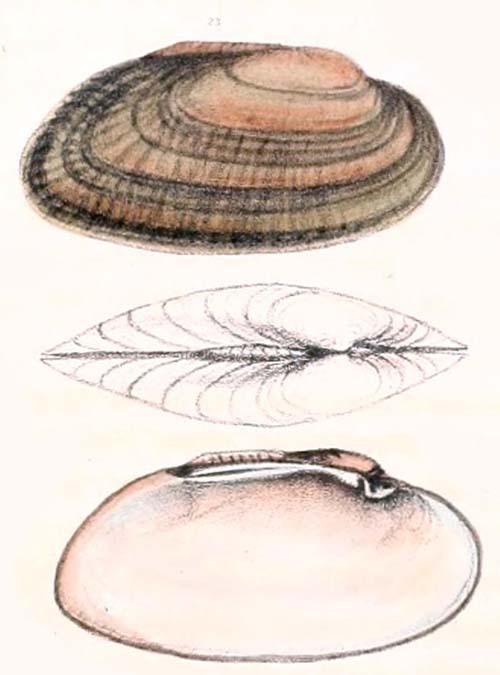 = Medionidus conradicus Lea, 1834. — Bogan (2010). = Medionidus conradicus (Lea, 1834). — Williams et al. (2008).
? Medionidus conradicus (Lea, 1834). — Williams et al. (2008). Rafinesque, 1864, [in] Binney & Tryon, reprint: 75. Lea, 1834, Trans. Amer. Phil. Soc. : 63 , pl. 9, fig. 23. 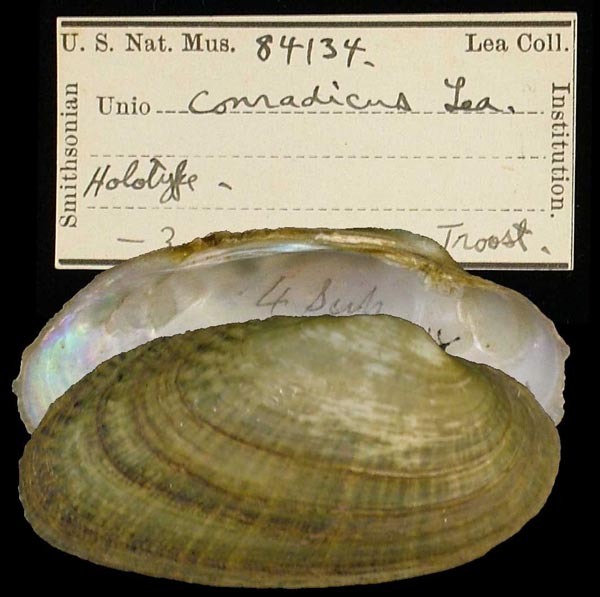 Type(s): HOLOTYPE USNM_84134, [no locality available - North America]. ‘Lea’ Conrad, 1838, Monogr. Fam. Unionidae: 87, pl. 47, fig. 3. Margaron (Unio) conradianus Lea, 1870. ‘Lea’ Lea, 1870, Synopsis Fam. Naiades: 32. ‘Lea’ Haas, 1969, Treatise on Invert. Paleo: N455 [as ‘Medionidus’]. ‘Rafinesque’ Simpson, 1900, Proc. U.S. Nat. Mus. : 744. ‘Rafinesque’ Simpson, 1914, Descr. Cat. Naiades: 731.